naming Archives - Marketing & Brand Strategy. Steve Poppe, Founder. So yesterday I suggested that Starbuck’s misnamed its new fruit flavored iced coffee product Refreshers, jumping straight to the benefit in the name, and not necessarily an uncommon benefit at that. Starbucks missed an opportunity. Here is link to the video explaining how Refreshers are made. Green coffee extract is the secret to the new product. Three words that together don’t particularly make the mouth water. No wonder they called them Refreshers. Here are a couple ideas and words that may have been overlooked in the naming meeting. Words that don’t deliver the benefit, but work to explain the new product. The Is of the Is-Does, as it were. -Young, you get the idea. Naming is hard. Think Apple. Brand are empty vessels into which marketers pour meaning. But consumers extract meaning from brands and the first experience in the name. Make it a good one. Peace. 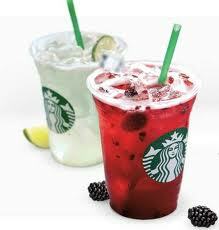 Refreshers is the brand name of a clear, cool new summer drink being offered up by Starbucks. The two flavors are Cool Lime and Very Berry Hibiscus. Were I the type to leave the office mid-afternoon and drive for a cool drink I’d def try one. The drinks are colorful and contain real pieces of fruit. Since they come from Starbucks they’ are “refreshers” and not at all to be confused with tea. Just like Dunkin Donut’s Coolatas (am I spelling that right?). The print ads look nice. And the energy thing makes a smart point, but the name is pretty goofy. If this product launch is an attempt to open up a new category – and I think it is – it really needs a product name that better reflects the “Is” not the “Does.” Naming is an art. I’m betting this product will be a modest success, but the name will be a hindrance. Some words in advertising and marketing are radioactive in their ability to turn off consumers. Radioactive in their ability to create consumer passivity. Unless you are Coca Cola, refresh is one such. Peace. I check out my blog analytics regularly and one of the search terms that gets me a lot of traffic is “naming.” So playing to the algorithm, I post today on naming. But what to say? Names, like brands, are empty vessels into which we pour meaning. The best names are organically tied to product, feature, function or target. A good name gets you credit for what you do without you doing it. My friend’s company Gotham Seafood has a great name. He sells seafood in NYC and his company has scale. He sells lots of fish. I wanted to name a web start-up for which I was marketing director Mashpan. It was a website creation tool based on drag and drop technology that let anyone design and build a site. It put a wrapper around objects on the web and let anything, yes anything, be dragged and dropped or copied onto a page. Quite a mash-up. Of everything. A mash pan is also a place to start home brew, but that’s a story for another day. The boss decides Zude sounded better. No context, not a great name. Though it did ultimately work (as a name). Our vessel-pouring was pretty good. For those of you with kids, you know how difficult naming can be. It’s even more difficult for companies. Don’t make it easy. Embrace it. Find the perfect name. It’s important. Peace!